Starting with four employees in 1972, Sudir Dhingra today employs 26,000 people; and his company Orient Craft, runs 24 factories in the National Capital Region. The secret of this success, he says, is remaining detached from business, and watching it as an observer. “I am fortunate that God has gifted me the ability to separate myself from what I am doing today. This has enabled me to stay ahead of the trade, and also anticipate the changes in the global market”, says Dhingra. He realised the importance of being detached during the crash of 1975-76; and the learning has remained with him. From 1972 to 1975, Dhingra says, garment exports brought him plenty of money, and the flow was steady. “All of a sudden, the global market crashed. No one was willing to buy garments that were selling like hot cakes the day before”, he says. It was a difficult period, and tested him as an entrepreneur. “We realised we had missed the train”, he adds. To tackle the situation, Dhingra travelled across the United States and Europe, and sold whatever was possible. There were losses; and it took him around an year to clear the mess. “I went to customers, interacted with them; and that is when I realised where we had made the mistakes”, he says. To ensure that his company does not miss the train in future, he decided to invest in technology and people. “I visited the Far East, and went to see the factories of our competitors. I also realised the importance of scaling up”, he says. He decided to set up a world class manufacturing facility. This unit was inaugurated in 1994, and it came up in Sector 18 of Gurgaon’s Udyog Vihar. It was for the first time that 1800 people were hired at a go in a garment factory—a decision that many in the industry said would prove to be suicidal. Dhingra’s decision, however, was heartily appreciated. 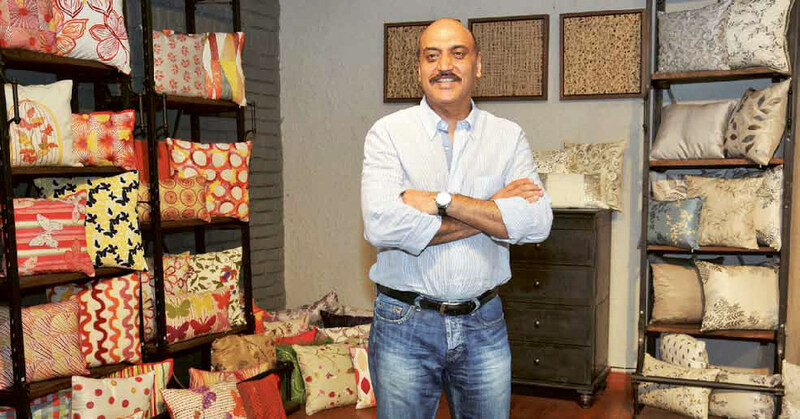 “The buyers loved the facilities and the infrastructure, and we had to look for further expansion”, he says with a smile on his face; adding that walking away from the beaten track has always given him results. Having been through the troughs of the 1975-76 crash, and the recent recession of 2008-2009, Dhingra says the learning has made him a more productive and efficient manufacturer. “My brief to the team was clear—that Orient Craft must become more cost efficient and productive. ‘Cut the frills and ensure that our share in the market remains stable’, was the goal”, he asserts. His focus on productivity and efficiency proved crucial, as Orient Craft emerged stronger during the recession. The company grew by 17 per cent during this period; and Dhingra also set up another factory, that was certified green to meet the expanding demand. “Last month, that unit was inaugurated, and it is the first green certified manufacturing unit in India”, he claims with pride. The USP of Orient Craft, he says, is a keen control on quality and production of complicated garments, that command a premium in market. While the industry average in India for an exported garment is under four dollars, Orient Craft commands eight and a half dollars per garment, due to the quality of their work. When Orient Craft gets a new buyer, the goal is to be among the top five suppliers in three years; nothing less than that. “If we are not able to achieve this target, it means we are doing something wrong”, says Dhingra. The Indian garment industry has a minuscule share of 12 billion US dollars, in a business that has a global turnover of around 500 billion US dollars. When asked the reason for this, Dhingra puts the onus on the government; asserting that the government of India has failed to support garment manufacturers. “If the Commerce Ministry is on our side, then the Textile Ministry opposes us and when both are on our side, then the Finance Ministry finds some reasons to put the Indian garment exporters in doldrums”, claims Dhingra, unhappy with the manner in which the State handles the business. There are traffic bottlenecks; excessive documentation; shipping takes a long time. He once had to hire an agent, to export his first lot of a thousand shirts to his friend in London, as he knew nothing about this business. Dhingra, however, is not against working with the establishment. “I think the garment industry has the potential to change the future of this nation, if the government understands the merit of working jointly”, he asserts. He has proposed a collaboration with the government, wherein the people getting work under National Rural Employment Guarantee Act (NREGA), would be trained and made employable by the garment industry. “If the government is willing to share the cost of training uneducated people, then we are ready to absorb them in our factories; as there is great demand for labour in this sector”, says Dhingra, who envisions a day when India would have a major share in the global garment industry. “The garment sector is labour intensive, and can do with uneducated workers; the need of the hour is for the government to understand this and collaborate with the private industry”, he says. This model was successfully being followed by Bangladesh, and would enable Indian firms to become cost competitive. “Cheaper labour means we become more cost efficient, and this will also enable a person to earn his livelihood for a longer time rather than offering work for 100 days, and then leaving him in the lurch to fetch for the remaining 265 days”, he says. Dhingra’s words carry weight, as indeed Bangladesh has left the Indian garment exports far behind with exports of 19 billion last year, and 30 per cent growth being predicted year on year. Almost 19 per cent of the people are working in the garment sector there, adds Dhingra. He predicts tough times ahead for domestic garment manufacturers, due to this competition from Bangladesh. Terming the decision to allow duty free import of 46 garment items from Bangladesh detrimental, Dhingra says companies that manufacture for the domestic market will be seriously affected by these cheaper Bangladeshi garments. While talking to us, the phone rings once again someone from abroad—perhaps a buyer or a business associate—is calling him and wants to set up a meeting. Dhingra tells him with a confident note that the Orient Craft factory in Gurgaon is just 20 minutes from the New Delhi international airport. He also rattles off the names of 5-star hotels in the Millennium City, that can be booked for the stay; adding that everything is within 10-minutes of his factory and head office at Hero Honda Chowk. Indeed the shift to Gurgaon has been providential. Dhingra admits this, and says that shifting to Gurgaon has been a positive move, as the city has expanded and is aspiring to be a world class city. The locational advantage, nearness to airport and availability of talent is what he likes in Gurgaon; but mentions that there is need to develop the infrastructure at a fast pace. “Mistakes happened in the past, and the Hooda government is now doing its best to improve things. The power situation has improved, and hopefully the administration will learn from past mistakes, and do things in a more planned way”, he says wistfully. To the budding entrepreneurs, his message is simple: Do not let today’s problems becomes hurdles to your future. Keep your sights on long-term goals, and believe they will happen. Serious thoughts from someone who says he did not know what to do when he was young, and became a business leader by chance. US Gas Boom To Change Global Geopolitics?